To our members within the U.S, Caribbean, Africa, and throughout the diaspora you have access to Kimberly to assist in you water security issues. Within BEMA International Ms. Kimberly Fogg is one of my key advisors on water security issues. We advocate for a systems approach to water security. An approach of both the internal and external components of water security from the source, to the home, and for the community. Water security is not just a matter of digging a well, but considering the entire approach of from well to to community center, to the home and for future usages. 21st Century solutions to 21st Century problems in water and waste management for both components of water security. Charles D. Sharp. CEO BEMA International. When Kimberly Fogg was a kid, her mother used to tell her that she had special powers. “I always had this unexplainable way,” she told MsXFactor. “I always had this, I don’t know…I did not grow up in a church and I did not grow up knowing the Bible – but I had this connection.” While she finds it difficult to describe the connection and its source, what she does know is that while on safari in Tanzania more than seven years ago, the connection became recognizable once again. “God began saying, ‘I want you to help – no, I need you to help.” What was God asking her to do? Who was God instructing her to help? Following the death of her father, Fogg embarked upon the voyage as a means of soul-searching. She recalls a defining moment during dinner in Kenya. The waiter was focused on her – so much so that everyone at the table took notice. “When he brought my food there was a strange light shinning from behind him and when I looked, I saw his name tag.” The waiter’s name was the same as her father’s, Alphonse – she knew in that moment that her life would forever change. How would it change? She was not totally sure until she came across a group of young children traveling to gather water. She would quickly learn that the young people did not have access to clean water, in their local area so they had to travel. The problem, however, is that the trek was dangerous, which meant that some never made it back home. If they did, the water they collected could be contaminated which eventually made them ill – resulting in death as well. She felt that she had to do something but at first she resisted. “Initially I felt sorry as I saw these beautiful little children traveling to collect water, but I was missing my beautiful house,” she said. 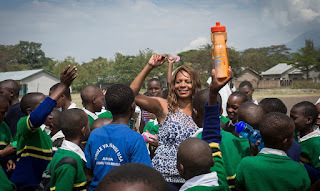 Fogg was obedient to that call and today she heads Global Sustainable Partnerships, a non-profit organization that provides access to clean and safe drinking water to schools, households, health centers and hospitals in Tanzania. She came across the technology, HydrAid BioSand Filters, after returning to the states from her safari. “The filters that I decided to use are manufactured in my hometown (Grand Rapids, MI) just 10 minutes from my parents house,” she said. “I was talking to someone who was doing work on my parents roof, telling him about what I had experienced while on my safari, and he started telling me about these filters.” And one of the two trainings each year just happened to be coming up. “I never said okay,” Fogg reports matter-of-factly. “I just started following the bread crumbs.